Note: This tutorial was the first tutorial I ever did. Because of this, it is not exactly that great of a tutorial. Rather than step by step instructions, it is more or less a guide on how to do something like the picture you see above if you are already somewhat familiar with Inkscape. I decided to do a better, more updated version. Version 2 if you will. You can find it here. I am keeping this original tutorial mainly because I just don't want to delete anything. Again; I suggest you go to this better tutorial. 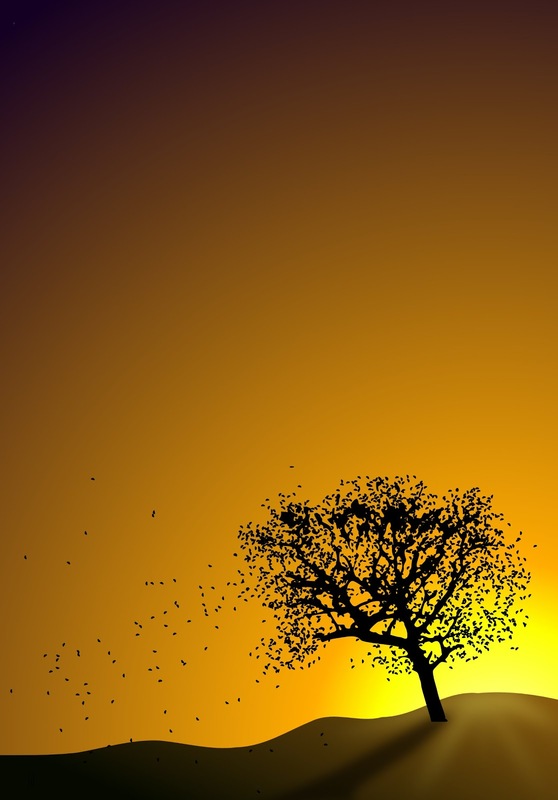 For this tutorial, we will be making a nice sunset landscaping scene. This is pretty easy to do but can look pretty nice. We will be using mostly Inkscape, but will use the Gimp some to help us with our initial tree (Inkscape and Gimp are both free program often used as a replacement for Illustrator or Photoshop). To begin, we will want to find a tree that we can use for our base. 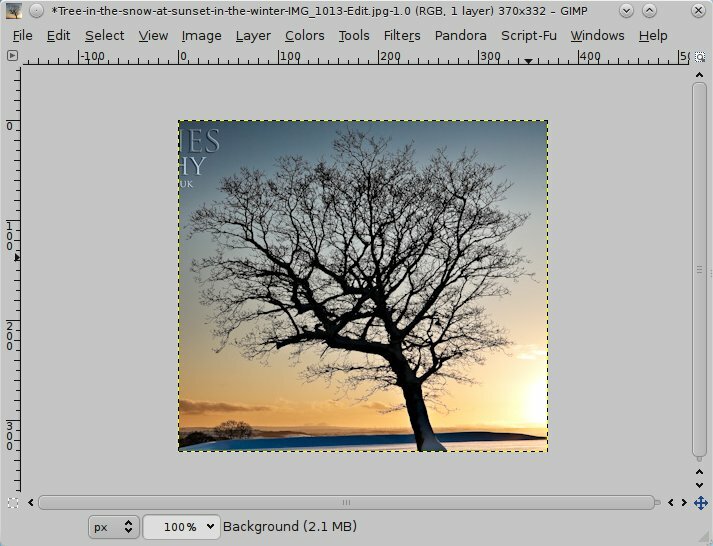 I did a Google image search for "winter tree sunset." 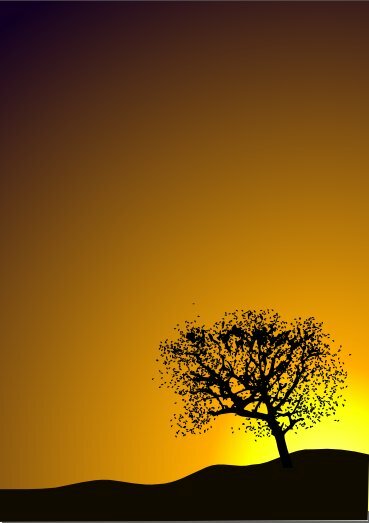 This brings up a lot of good looking silhouettes of trees. The image does not need to be high quality. 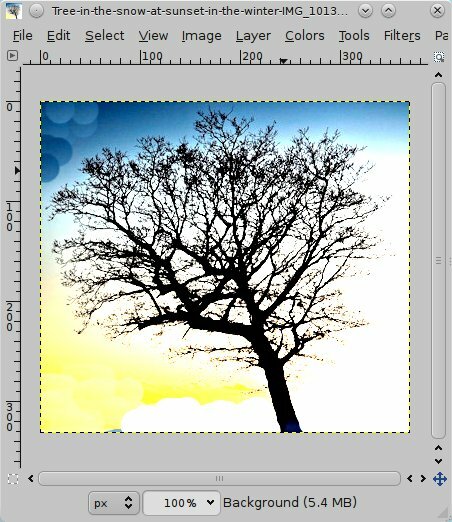 Once you have your tree opened in the Gimp (or Photoshop), crop out everything but the tree. At this point, it is probably a good idea to take out as much of the background as possible. Under Colors/Brightness Contrast... turn up the brightness a bit and the contrast significantly. We will now place this image in Inkscape and do a bitmap trace (Path>Trace Bitmap). I did color scan with 8 levels. Once it has traced, you will need to ungroup the picture (Ctrl+Shift+G) and pick the layer that looks most like what you want and delete the rest (you can go ahead and make the tree black at this point). 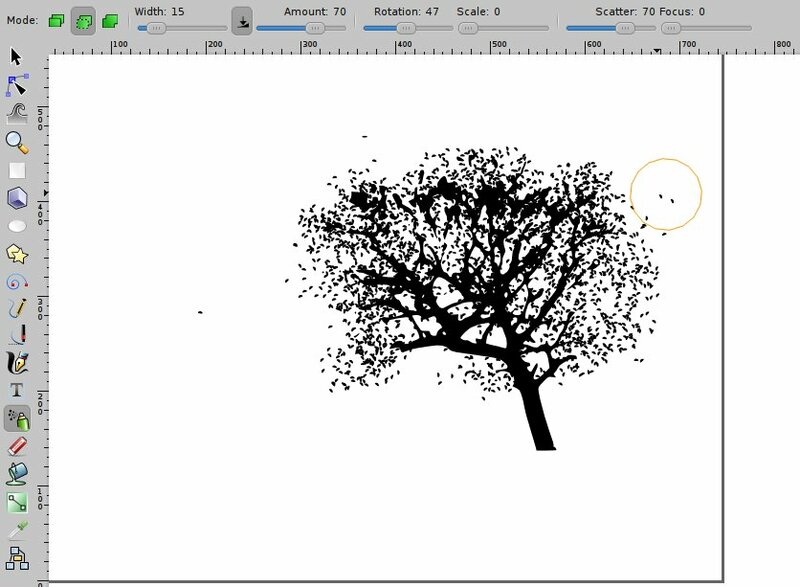 Now we will use the bezier curve tool to draw the land. 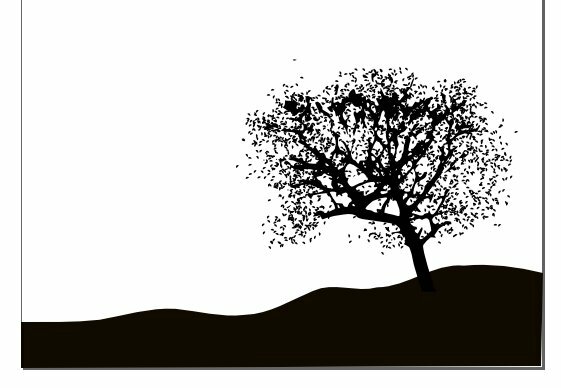 I like to draw it so it looks like the tree is on a slight hill. I try to make a lot of clicks with the bezier pen then once I have made the shape, press Ctrl+L to soften and curve the lines till it looks how I want it. The Hill can be black as well or perhaps a dark brown/green depending on the look you are going for. Next, add a rectangle that covers your entire screen. Throw it in the back and add a radial gradient. 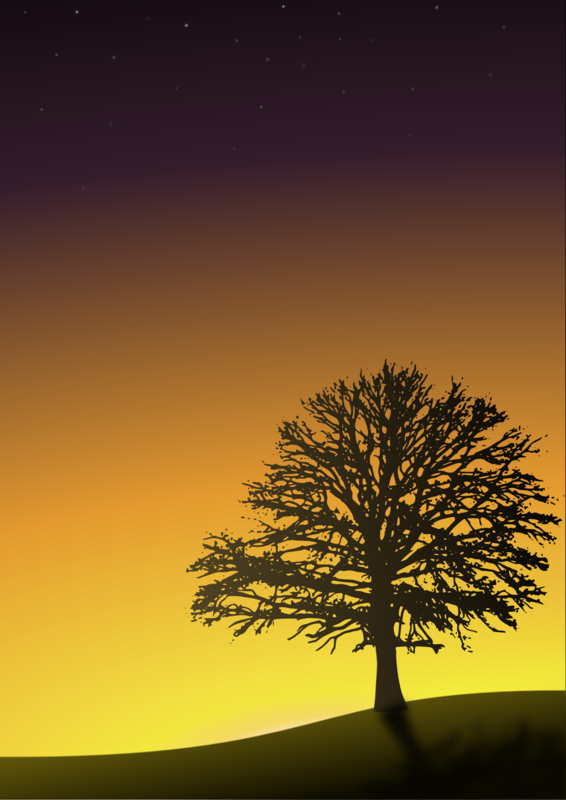 The gradient obviously should be dark violet on top and a lighter, yellow color on bottom to simulate the sunset. I like to add a few stops in the gradient so I can add some more colors. There you have it! The basic landscape. Now that we have the basic landscape, let's see what we can do to spruce it up a bit. Add a small gradient on the land. 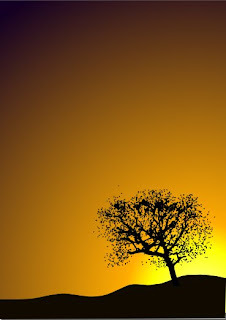 Add a shadow for the tree. Do some highlight rays where the sun is. Add some stars if you made your background fairly dark. Add a quote or scripture. 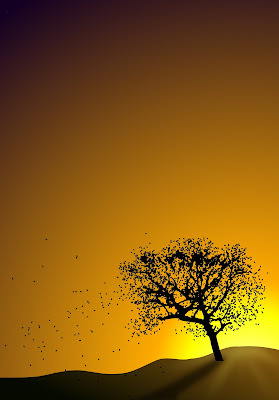 Add some flying leaves to make it look like Autumn. Thanks tooman! I just checked out your blog and love the ideas. The name is great too! There’s no way I would’ve thought about creative designs we can make with gimp and Inkscape. It had great tutorials at the same time opportunity for us to ask questions. Each type of design requires different type of skills and efforts so a person must know that what he wants to use. Well thanks so much for your thoughts and efforts that you put in your post for making it easier to understand for everyone. Cool tuto, nice effect :-) Thanks ! I understand how to create a landscape. What I was looking for was how to do it in Inkscape written for someone who has never used it before! Your tutorial presumes too much. A good software tutorial should always presume the student is a complete and utter noob. I am commenting about this because your landscape tut seems to have taken over the net and I can't find another one for this specific task that actually includes the tool info in each step and how to use it. "Your tutorial presumes too much." I think you are right. It probably does. This is one of the first tutorials I ever did, and as you have pointed out, it has room for improvement. "A good software tutorial should always presume the student is a complete and utter noob." Not true. Perhaps a good beginner tutorial should presume as much, but certainly not all tutorials should be detailed to the point of assuming the user does not know how to do anything. That being said, I should have specified that this is NOT a beginner tutorial and HAS the assumption that the user is somewhat familiar with Inkscape. "I can't find another one for this specific task that actually includes the tool info in each step and how to use it." As I mentioned before, this was really the first tutorial I ever did and I realize it certainly has room for improvement. I am quite busy right now with work, but I think redoing this tutorial would be a fun project. Thanks for the suggestion (well... implied suggestion?). Hopefully I can have a better tutorial up soon. Done and done. Just redid the tutorial. Rather than deleting or updating this one, I just made a new one. Click here to go to the updated tutorial. hi..Im college student, thanks for sharing :) inspire..!! !